World clocks in any size with 24 fancy styles for Windows desktop for all time zones that can be selected from a big world map. With a sophisticated AM/PM-Indikator and with pleasant and configurable sounds. 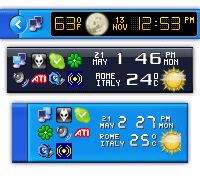 Chameleon Clock is a digital desktop clock which provides an attractive and useful alternative for the Windows system tray clock. Its appearance can be easily changed using widely available Winamp skins or bitmaps. 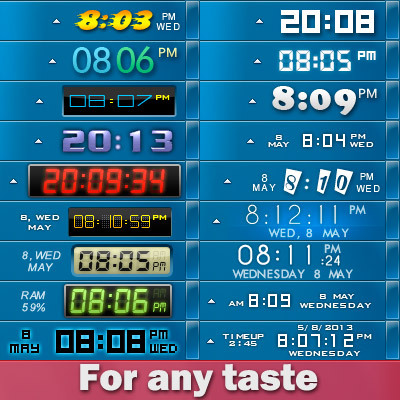 It also includes Wallpaper and Screensaver clocks, MP3/WAV/Audio CD alarms, birthdays, precise atomic clock, calendar, time zones, countdown, and other time tools. The program was designed for automatic control of the time children spend playing their games during a day. Even if an adult is not near the child, ChildCentre controls the total time and closes the program that is running (or Windows depending on the defined mode) if the time limit is expired. Then ChildCentre does not allow to start dedicated programs (or to work with Windows) during the rest of the day.